I want opinions about the differences between then, please? I use firestorm, I want to switch to Catznip. And I wish to know what viewer is better for creators? I've used FireStorm for years, since back when it was Emerald (Yes, I know; don't ask) - I've made the switch to Catznip myself and loving it. Amazing inventory-management features, such as setting any folder as a system folder, choose where to put received items, etc. 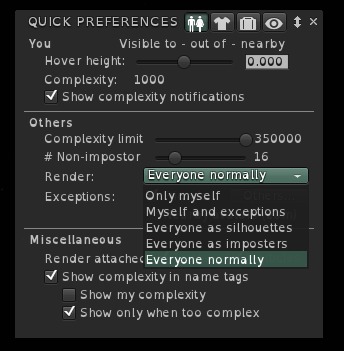 Many of the same features as FS, but located in different areas, example: Refresh Attachments in Advanced Menu, Zoom to Avatar in "People" box, etc. ... thinking of more... ummm... Nope, can't think of any more, truthfully speaking. Someone may come up with something here. I use firestorm, I want to switch to Catznip. do so and try yourself? Install both and work with them. except of the objective tool for inspection as Fiona pointed to, it's totally subjective, no standard in experience for anyone, all depends on like and your machine/connection. I have a quite standard machine, Firestorm works good on it. Problem is mostly: people use it out of the box, and just drag as many sliders to the right as possible. That makes even the high end newest machines to lagmonsters. Try them both and pick your favorite. The only thing that really matters is that you use SL and your choice of viewer complements that. We don't have or maintain a list of differences or reasons why to use Catznip, although as a tip for newbies to the viewer I would say "right click" and join the in world group (Top bar > Help > Catznip Support Group). I realized the Firestorm crashes a lot, my connection is very good (100mb) also my graphics, sometimes I use the wifi, maybe thats it. I think him a little heavy. I wish something more practical and "light". I'll try Catznip and see if works better for me. Thanks all for make it more clear. Have both installed - have both pinned next to each other in my launch bar. Launch the new viewer (Catznip or any other you're checking out) - Spend an entire day with it (do not use your 'regular' viewer for an entire day in SL) No matter how frustrating anything seems, that will subside as your comfort level grows. Do this for at least a couple days of SL time. After a couple days of switching back and forth: try to use the new viewer all the time. Then after a week or so this will happen: If you find you never go back to your previous viewer, you can unpin it from the taskbar (but don't delete it) or if you find you keep popping back to your previous viewer because you need [specific feature and cannot find it in newer viewer] then keep both and use one for 'fun' and the other on as-needed basis or if you find you are still always returning to your normal viewer, ditch the new one and know that you gave it a fair shake. For myself, I found that option one was my case. Everyone is different, so as was said: go with what YOU like the best. Because the world on the other side of that viewer is always going to be the same world. From Catznip beta 12.1.6 ... not all of this is publicly available, I'm not sure what the current beta on the website has, it's a little behind. Here is me at a party rendering my friends normally and others as silhouettes. The drop down has been added in the current beta, so maybe give us another shot in the next release. Here is me at a party rendering my friends normally and my others as silhouettes. From our own testing at shopping events (we do that a LOT) being able to switch everyone off is awesome fast. It really goes to show that avatars are SL Achilles heel .. ironic, and kinda sad. We were loathed to do it as an empty SL isn't any fun. The current beta period has been a little weird, there has been a lot of work done & its been released to patreon supporters, but we have had a couple of showstopping bugs that have ment putting every one out as public wasn't possible (and a good thing we didn't). It's ignorance, not avatars which causes lag.